Well hello everyone!!! We had a fantastic weekend. Saturday was my hubby's graduation party which turned out fantastic! Can't beat lots of friends and excellent food. Sunday morning my birthday however was a little bumpy at 4am ended up in the ER with my 12 year old for a ear infection. I ended up coming home just in time to shower and make it to church. I came home and slept most of the afternoon so it was a nice quiet birthday! We'll celebrate this weekend with dinner. I couldn't wait for the last two days to pass so I could get to stamping again. I've seen all these challenges and inspiration that I had to post something today. Sorry the picture is so dark but it's night time here. I'll probably repost a new picture tomorrow morning. This card is for the Cupcake Craft Challenge blog. The challenge is a inspiration challenge with pretty yellow flowers. I used my last big piece of Wild Wasabi. 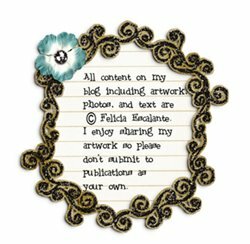 I really wish Stampin' Up! would keep some of these in colors because they are some of the best colors they offer. I used my Swiss Dots cuttlebug folder on the two yellow strips. I used the stamp set Women of Life by Papertrey Ink and the sentiment is from Stampin' Up! called Edgy Eloquence. For the inside of the flowers I used some green flock. I tried to flock some chipboard circles that fit perfect inside the bigger flowers however that didn't work out too well. But I think it looks perfect the way it is. It's really so summery. Definitely looks better in real life. I hope you ladies check out the Cupcake Craft Challenge blog they have some cute things going on over there! Felicia - Happy Birthday !! I hope you have a great evening out this weekend. I hope your son is feeling better - ear infections can be so scary at times especially if accompanied by a fever. Congratulations to your husband for graduating. I love this card - it is so sunny and absolutely love the saying - I made me smile !! This is a beautiful card!! Love your coloring. Congrats to Hubby, Happy Birthday and I hope your 12 year old is better. Busy girl! It always happens all at once for some reason. holy wow! this card is so great! those colors ROCK!! Happy birthday!! and a big congrats to your hubby! 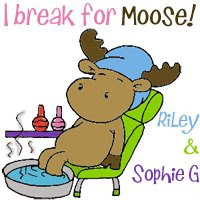 What a fun card with such a wonderful sentiment! I love it Felicia! It's so bright and happy! Hope the ear infection is on the mend...Happy B-Day and the card is great! Very cute card - like the bright colors. What a lovely sentiment - I wish everyone subscribed to it. 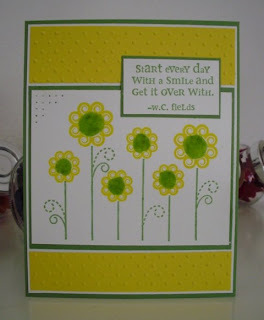 I love the colour combo, a very sunny smiley card. wow, this is so gorgeous - so bright and cheery! I love green and yellow together! And you used Swiss Dots which is my most fave embossing folder! Love your card! TFS! very pretty! your flowers are so bright and cheery. i too was hoping that SU would come up with a new color family with the retired in colors but that was wishful thinking. hope the family is doing okay. awesome achievement with your husband's graduation and hope the little one is feeling better.